How disappointed y’all must be for still being alive today, and conscious enough to read this sales blog. We’re sorry, really we are, that you weren’t taken away by the predicted cataclysm for your rendezvous with God, Satan, or a patch of dirt. But please be reassured. You are going to die. Yes you are, all of you. 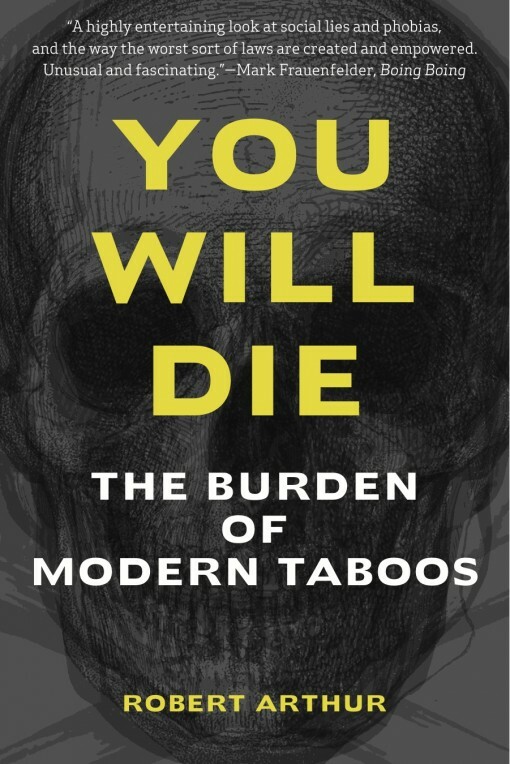 Author Robert Arthur can tell you about this and a huge slate of perverse thought processes that confuse our lives in his book, YOU WILL DIE: THE BURDEN OF MODERN TABOOS. Happily, this book just arrived at Feral/Process headquarters from the printer. You might have seen an excerpt from this book some years ago on Boing Boing. In fact Mark Frauenfelder himself encouraged me to publish this book, as he felt the Feral House book vibe was intimately connected to it. I’d love to know if y’all agree with Mark F.’s assessment. You can get it now from our sister press Feral House’s website, but if you want to wait, it will later be accessible from Amazon.com and perhaps a few of the more enlightened booksellers that believe that some books are worthy, perhaps even more worthy, if they don’t receive approval from the NY Times or your local NPR station. The Feral House edition of YOU WILL DIE is quite different from Mr. Arthur’s self-published version, and it’s revised and expanded—with new material about death, no less. Dog bless all Feral House and Process Media readers this holiday season!